This scampi soup is definitely one of the more concentrated of the market! Developed in accordance with the know-how of the Azais Polito House and Sétoise tradition, it is a true concentrate of flavors... The use of high quality raw materials (without dying agent) and its traditional method of production gives this product an incomparable taste. Rapeseed oil, fresh eggs, garlic, salt, turmeric, vinegar, E330, Paprika, Pepper, Saffron and Carotene. It is delicious as an accompaniment to Fish and Shellfish soups. For a real Sétoise presentation, spread it on croutons before putting them on the soup and grate some cheese on top of it all. 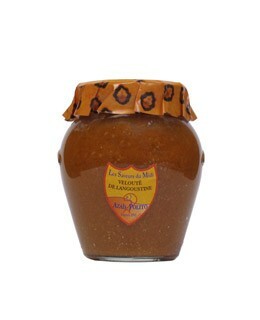 Rouille Sétoise can also be used for canapé for the aperitif.